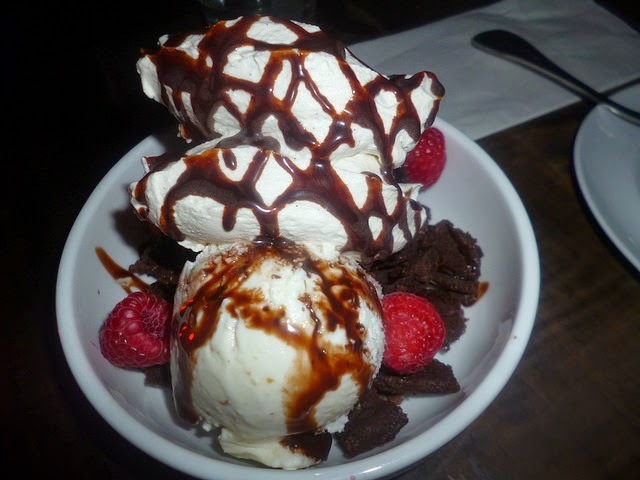 Forays of a Finance Foodie: The Lodge Club—Bringing Gastro Goodness To The West Village! 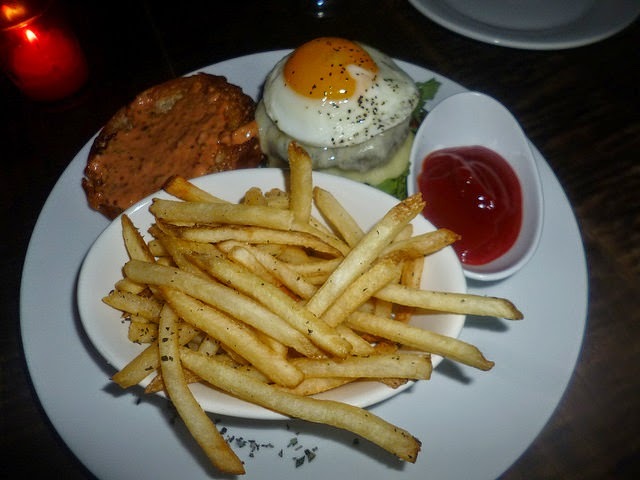 The Lodge Club—Bringing Gastro Goodness To The West Village! I really enjoyed the dark dance club atmosphere of the dining room at the back of The Lodge Club in the Village. The music varied from disco to punk rock to today’s alt rock and the food was fine gastropub fare. They are getting famous for their roasted bone marrow, but I stuck to more basic Modern American versions of the comfort food classics that are on the menu. Portions were respectable and most can be shared between two diners. The Lodge Club is from the same folks who brought you Bounce and Vero Midtown, so you just know they have high standards for ingredients and kitchen staff. Chef Olnowich has works for Olives NYC and the restaurant at L’Ecole (the French cooking school downtown) so you just know that he’s creative before you set foot in The Lodge! My dining partner and I started off by ordered the delicious Skirt Steak Tacos ($17) which was a portion of three four or five inch soft flour tacos stuffed liberally with soft medium rare marinated skirt steak and covered with fresh red peppers, sweet onions and cilantro leaves. They tasted fresh and juicy, and the natural citrus sauce on them topped with a squeeze of fresh lime wedge was heavenly! I had to try The Lodge Burger ($19) which was made with ground chuck, hanger steak and short rib blend with melted Grafton Cheddar, roaster tomato, red onion, a fried hen egg and a secret sauce on top. The secret sauce tasted a spicy blend added to a traditional BBQ sauce recipe and was quite tasty. The burger has a firm outer crust and soft inside, so if you like a crunch when you bite into your burger—come here! It was a big enough portion to cut in two and it came with delicious fairly skinny fries fried in truffle oil. As one side, we tried the Brussels Sprouts With Candied Bacon and Brown Butter ($8) and these gorgeous roasted sprouts were just dripping with buttery goodness after being roasted to a golden glow. You can’t go wrong with these! 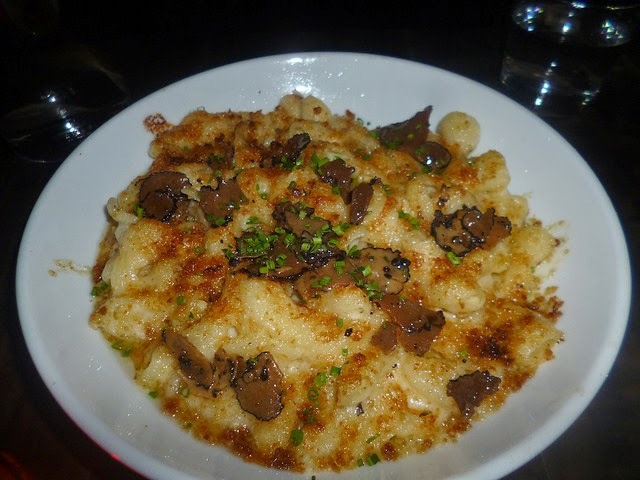 Our second side was the super rich Truffle Mac And Cheese ($13) made with spiral pasta and tons of Grafton cheddar sauce. There were some nice spices in it like garlic, green onions, oregano and thyme—and honestly, when not shared this alone can make a nice entrée for one mac and cheese maniac! We ended a delightful gastropod dinner with their one and only dessert for the night: a Chocolate Chip Sundae ($8), which is actually a huge homemade chocolate chocolate chip cookie with a single scoop of vanilla and a single scoop coconut ice cream, topped with homemade whipped cream, fresh raspberries and fresh fudge sauce. It’s pretty large and decadent and again, I would recommend that two people share this especially after consuming the heartier items on the menu beforehand. The Lodge Club has events each week and most of the time you can catch a wonderful art or photography display on the side walls of the front room that includes the bar. 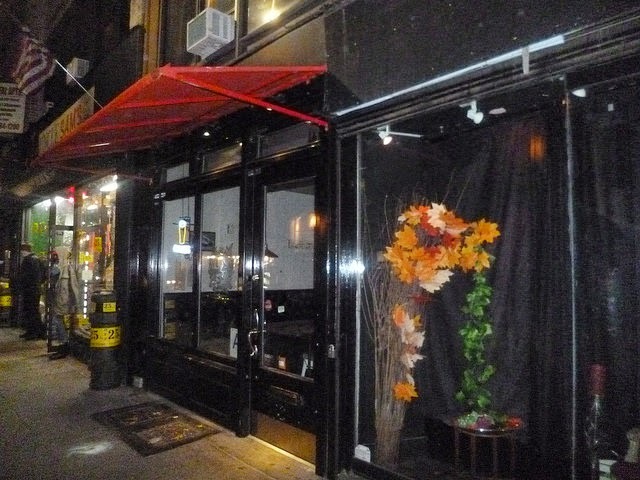 The ambience is cozy, the staff is friendly and reservations are not necessary. I predict that this will become a big neighborhood hangout for those who just want and after dinner drink but also want to be able to grab high quality pub and American fare till late at night.